The year of the dragon begins today. It is an auspicious year. Dragons partake of the five elements: water, earth, metal, fire, and wood. Like poet Walt Whitman, they are vast, they contain multitudes. After a Green Dragon or two, you too will be able to breathe fire. 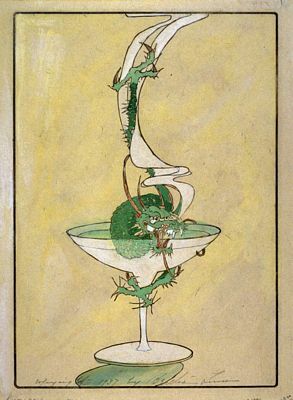 The Green Dragon Cocktail is a simple, sweet drink whose most unusual ingredient is kummel liquor (a blend of caraway and other spices). While its origins are unclear, the classic version appeared in The Savoy Cocktail Book by Harry Craddock in 1930. The following recipe makes one Green Dragon cocktail. 1/2 oz. kummel, 1/2 oz. green creme de menthe, 1 & 1/2 oz. gin, juice of half a lemon, 4 dashes of orange bitters. Fill a cocktail shaker half full with shaved ice. Strain the liquid into a chilled cocktail glass and garnish with a twist of lemon. Drink! 1. Bertha Lum - Green Dragon Cocktail, 1937, San Francisco Museum of Fine Arts. 2. Bertha Lum - The Woman In The Chinese hat, 1924, San Francisco Musuem of Fine Arts. 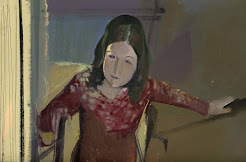 Also: May I direct readers to the excellent Bertha Lum website by Laurent. Happy New Year from a Wood Dragon!! Happy New Year to you, mighty five-fingered dragon! Delilah, it's quite tart, actually. A sweet drink wouldn't do for a dragon. Of course, it has to be green! Bertha Lum was one of the first American woodblock printers whose works I saw.